Jenova Chen tried to implement character physics, but discovered that player behavior wasn't what he had hoped. Journey is leading the way at the 16th Annual D.I.C.E. Awards this year with 11 nominations, and Jenova Chen, co-Founder and Creative Director of thatgamecompany, gave his talk about the process of eliciting the emotional response that makes Journey the experience that it is. "What kind of emotion can a videogame communicate," he pondered, "At thatgamecompany, we always start with emotion and work everything around it." He described the arduous development process, the extra year of development time, and a handful of features which didn't end up working for the game. 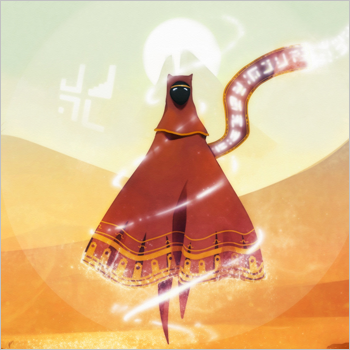 Along the way to the final product, thatgamecompany tried out a number of features for Journey which either detracted from the experience, or elicited the wrong emotions, prompting Chen to cut them entirely. A particularly poignant example is the character physics. "Wouldn't it be great if you could actually feel the existence of another human being," he wondered, prompting them to implement it for a time. The idea was that players would be able to help each other navigate the environment, lending a hand to help another player climb a rock, for example. Naturally, that's not how it actually played out. "Rather than push each other to help each other," he said, "they like to push each other into dangerous things, to kill each other." Likewise, displaying player names was considered, but given the "aggressive" nature of many handles, and the fact that real world references can pull a player out of the game world, the option was canned. "Most people don't want to know who's on the other end of the computer," he said. What really makes Journey work, according to Chen, is the shift to a barren setting so "the other player becomes the focus." Unlike in many other games where "the other player is just a tool to be used to defeat the bosses," Journey encourages players to "like each other, not kill each other" by providing energy, the resource of the game, when you come across another player. "Journey is a game about strangers," he said, "Look at them as a pure human being." There were troubles as well, with development going a year over budget, which put the company into a dangerous financial situation. But in the end, Chen believes it was well worth the troubles endured, referencing player feedback as a source of great satisfaction with the final product.